Last week I posted some costume ideas that were obviously 97% Photoshop-based, so I decided to find pictures of Real Life costumes I've made to prove to you (okay, really to remind myself) that Once Upon A Time I made things in the Real World and not just on the computer. I don't think I've ever made a costume for Zoe because she always begs to be a Disney Princess, or a Mermaid, or a Fairy, or a Fairy Mermaid Princess. Boys' costumes usually require a weapon. At least around here, they do. For Jake's first Halloween, up until about 4 PM on October 31st I felt very strongly that it would be stupid to dress him up. Then, right around 4:01, I became frantic with Mommy Guilt and decided his entire life would be ruined without a costume. All this, and no candy? Fast forward six years... 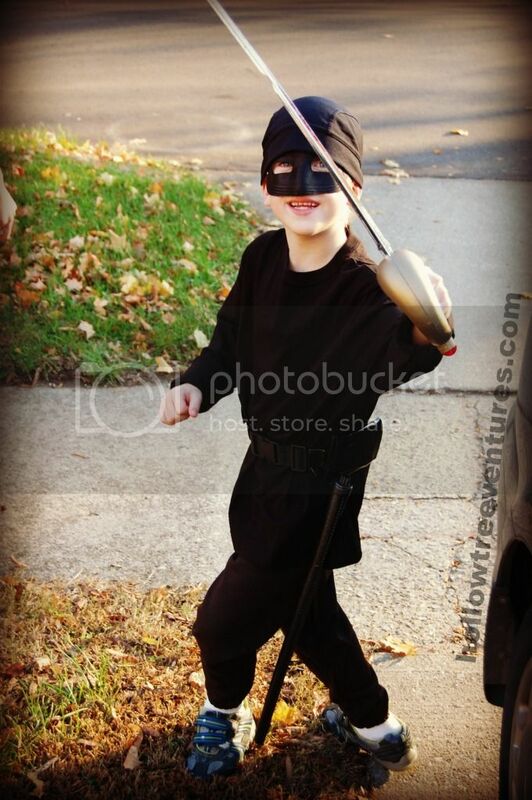 I didn't pay Jake to dress up as a character from The Princess Bride, nor did he ﻿know how it would make my heart swell with joy or that it would catapult him to the top of my list as Favorite Child. He requested it all on his own, and we spent the whole day hunting Rodents Of Unusual Size and pretending to spike everyone's drink with iocane powder. 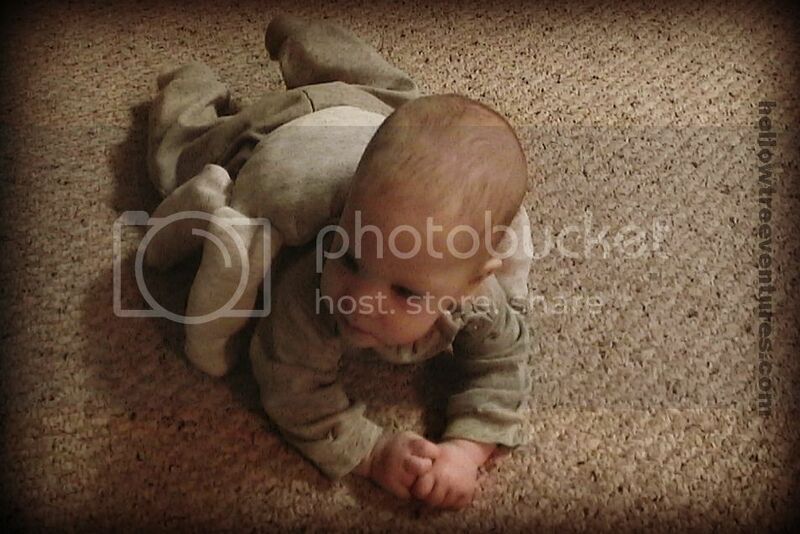 This photo remains one of the few tangible pieces of evidence I have that I might be doing something right as a parent. "You mean you wish to surrender to me? Kennedy never, ever asks for anything - he probably didn't even ask for this costume, which would've made me want to make it even more. 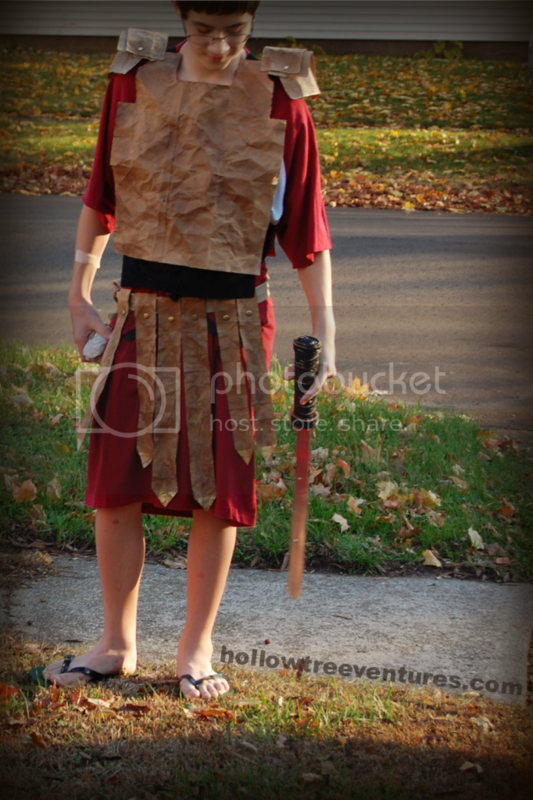 But five years ago, he decided at the last minute to go trick-or-treating for (sniff) the last time; he wanted to be a gladiator, and I was determined he would be a gladiator. His armor was made of inside-out frozen pizza boxes (yeah, we eat a lot of frozen pizza - yeah, maybe too much), crumpled and dyed with walnut ink to look like leather, held together with brass paper fasteners. He'd better get married in that costume. This Spartan appears to be on a break. Arrrr. I'm not proud that most of this costume (the shirts and belts) came from my closet. To answer your question, No, I am not cool. It's a button-down shirt with a black t-shirt over it, which I cut into a deep V-neck then poked a few holes along the sides and loosely laced it back together with another strip of black fabric. We made a pirate map together and tucked it into his belt. I gave Jake facial hair with an eyeliner pencil and we drew a pirate map together, but the part that still makes me laugh every. single. time I see it is the cluster of curly chest hairs I drew peeking out of his shirt. I'm laughing right now, just thinking about it. in the making of this costume. Ahhhhhhrghh, the cuteness, it hurts my eyes! 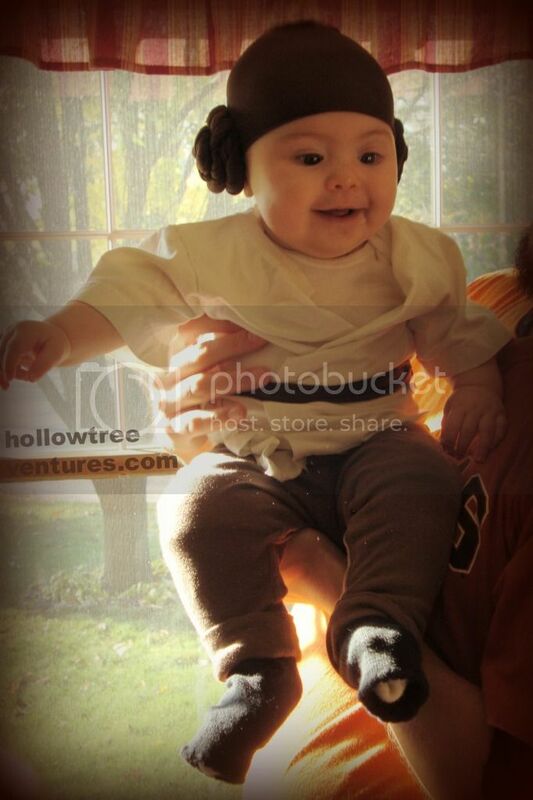 This is Maddie last year, back when I actually still wrote on my craft blog - the upshot being that there's a full tutorial for making a baby's Princess Leia costume if you feel the need to make some tiny hair buns of your own. The force is also adorable. Hmm, that's only five, and Stasha's Monday Listicles topic over﻿ at The Good Life is "10 Halloween Costumes." 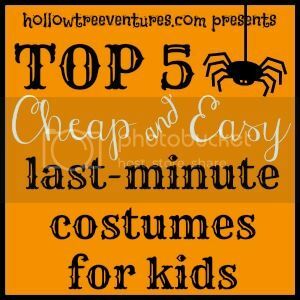 So if you want to see the other half of my list, you can check out last week's post that has five more costumes, all of which you could make, but none of which I really did make. Except for the first one, but that was only for the picture. Go ahead and check it out - it's probably the only way you'll ever see how good Mark Zuckerberg's hair looks on a baby. If you click the banner below, I'll give you half the candy I'm planning to pass out on Halloween! I can hardly remember what I was going to write because I have been slayed by Maddie's cuteness! Oh yeah, you have full credentials to write a parenting book because of that Princess Bride one! I bow to your superior skills. 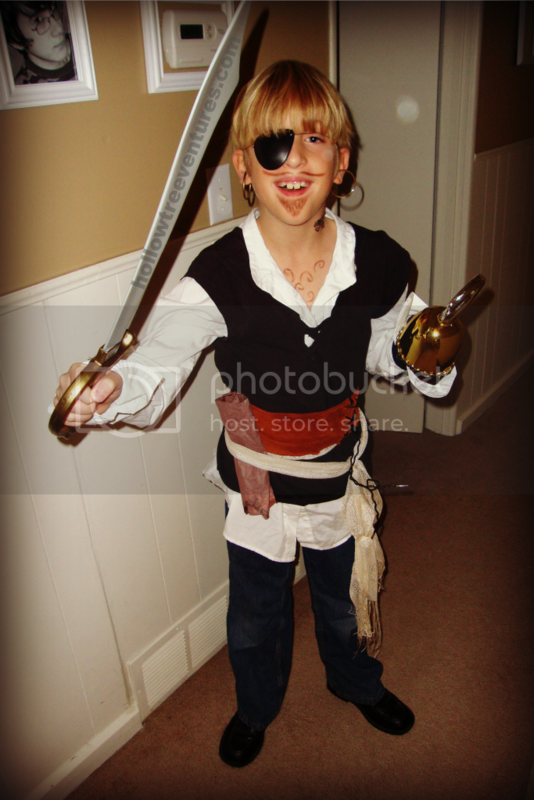 For the first Halloween my youngest was old enough to go trick-or-treating I asked him what he wanted to be. His answer? An apple. So an apple he was even if everyone thought he was a red pumpkin. After that he was a dinosaur for about 4 years in a row. Hey, the costume was made out of fake fur so it was warm and it isn't my fault it still fit. The dinosaur thing was OBVIOUSLY meant to be. 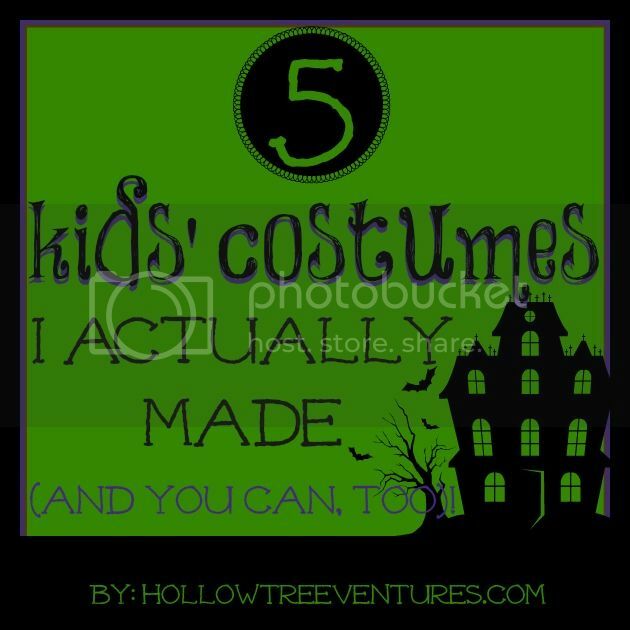 Heck, I'd make my kids wear repeat costumes even if they *didn't* fit! Those are some awesome costumes! Love the gladiator and the Westley costumes. And Princess Leia is adorable! Wow, that gladiator one is rather awesome! I think I have plenty of clothes to pull of a mean pirate. YOu and I need to go shopping ha? Do the chest hair, for real - I don't know why it cracked me up so much, but it was soooo funny! You are so creative, and I love the Dread Pirate Roberts (best movie ever!). Those are awesome! I am having mommy guilt right now, as I am so not prepared for Halloween, and I feel like I should be, but I just don't have enough motivation to do something. I think I will have to check out your next post for some ideas! These are all amazing! I am impressed with your creativity. Why didn't I think of drawing the curly chest hair the year my youngest was a pirate?! Yeah, that's what could be heard if I ever tried to actually make any of these adorable costumes myself. The baby Leia one...oh my heart. almost makes me want to have another just so I could do it. almost. Don't fall into her trap! Sometimes she makes me want to have more, too, but then I also see her in the middle of the night when se JUST WON'T SLEEP, which kind of cures it. Dammit! You're so creative. Its not fair. I have great ideas but zero on the follow through department which means my pocket ends up paying a stupid amount of money. Except that one year...I spent a total of 46 hours (yes I counted it) making a mummy costume for my exhusband. It was kickass. I think I burned it. Oh my - I just peed over Princess Leia! You've got skills! these are soo awesome, i am store-bought costume all the way. Jake is now my favorite, too! :) I don't know where he came up with the idea, but I was all for it! I so much want to see an all baby version of Star Wars now. Someone has to have done that right? I'm going to be really, really disappointed if no one has. The westley costume made my heart swell! Favorite movie of all time. I've thought about this one for years and haven't gotten it together. Next Halloween!! Nice job, crafty mcCrafterson. LOVE LOVE LOVE the Wesley costume! I haven't been able to check you out much lately (oh, that sounded porny! ), what are they doing this year? Did you mention that? My kids are going ala Store bought this year. Breaks my heart but since we JUST moved, like 4 days ago or something, and they TorT on the 25th (WHAT???) in my new 'hood, there is simply no time. So Gerrik gets to be a Costco Bumblebee Transformer and Gavin is Handy Manny. Todays job in finding a child sized construction helmet. Or hard Hat. Or whatever it's called...they USED to have them in all the dollar stores and now I can't find one ANYWHERE!!! Figures! Glad you made it to your new digs! And don't feel badly about the store-bought costumes at all; not only do you get a free pass on EVERYTHING for 2 or 3 years after a big move, but I think kids much prefer the ones from the store anyway. As for mine, Jake just has a mask - I have no idea what he's supposed to be - Zoe has a costume from the store that we just recently took out of the package and appears to be a slutty bat, and I have no idea what the baby will be. Should be interesting. OMG I LOVE the baby leia costume! Haha.. the Leia costume is great. I actually made one for my daughter on her first Halloween. She hated it and cried the entire time. But there's something so adorable about a baby in a wig. Her brother, Luke Skywalker, was much happier. Aww, I bet they were crazy cute! Maddie wasn't thrilled about her wig after a while, either. If I'd known she was going to complain anyway, I'd have made her wear a tiny gold bikini.